In 1941, while a high school senior and working evenings at the Daily Review in his hometown of Bisbee, Lou turned out his first sports page when the sports editor went to lunch and never came back. From that day on, Lou was a sports editor. Formerly a sportswriter, assistant sports editor and promotion director for the Arizona Daily Star/Tucson Citizen (1957-84), he was owner-editor of the baseball publication Voice of Collegiate Baseball. The newspaper, the brainchild of the late J.F. “Pop” McKale, covers college, junior college, high school and international (OIympics, etc.) baseball. 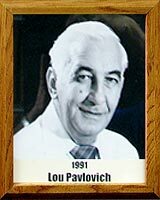 Lou has won numerous honors throughout his career, including the U.S. Baseball Federation Award, Award of Merit from the American Baseball Coaches Association Hall of Fame and the Southern Arizona Baseball Association Hall of Fame Award (sportswriter). While promotion director of the Tucson Citizen, he won many state and national awards, including the High School Opinion Poll, which drew 153,000 metropolitan Tucson students to the voting booths for 12 years. Most of Lou’s civic contributions have been youth-oriented, including a host of Little League activities and coordinating Football Fans Night (with the University of Arizona and Tucson Citizen) at which Tucson Youth Football youngsters were the principal participants. Lou also collaborated with Max Spilsbury, former head football coach at Northern Arizona University, in writing the book Slot T Football.